The Battle of the Bulge Memorial Monument commemorates those who made the supreme sacrifice for their country and to the heroic American soldiers who defeated the German armies in the Ardennes Campaign. Located in Jefferson Barracks Historic Park on the bluffs overlooking the mighty Mississippi River, the VBOB Memorial Monument was erected on the eastern side of the walkway leading from the Powder Magazine Museum to the Veterans Memorial Amphtheater. The National Battle of the Bulge Monument was dedicated on November 12 at Valley Forge Military Institute in Wayne, PA. The National Commemoration of the 50th Anniversary of World War II The Battle of the Bulge was held in St. Louis, MO, on December 16. Many say that this was the greatest veterans reunion ever held anywhere. The Monument is a replica, in shape only, of the National Battle of the Bulge Monument. The design of the inscriptions on the front and back are original to this Monument and no other. The combat units listed on the back are represented by at least one member. Most battalion-size units not listed were attached to a Division that is listed. It was impossible to list all the units that fought in this battle. The intent was to list those represented by the Gateway Chapter membership only as it was through their efforts that the Monument became a reality. Mr. Stan Wojtusik, National President of the VBOB, was keynote speaker at the Monument dedication on Sunday, October 12, 1997. The VFW Color Guard, the Community Band from Millstadt, IL, the firing squad from Scott Field and the punch and cake served by the St. Louis County Park District helped make for a memorable dedication service. Park rangers estimated that over 1700 people attended the ceremony. The Monument site has been upgraded with new flags, flagpoles, dusk-to-dawn lighting and rose bushes since it's dedication. 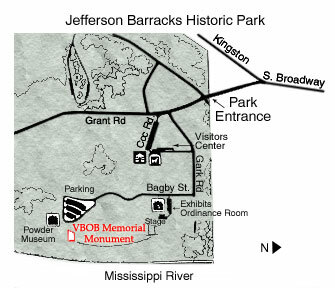 The Kingston/Broadway entrance of Jefferson Barracks Historic Park offers the best access to the Battle of the Bulge Memorial Monument. The $20,000 price of the Monument was paid for by the Gateway Chapter members along with many contributions received from civic-minded organizations and individuals. It was a gift to Jefferson Barracks to memorialize their comrades who made the ultimate sacrifice for their country in the greatest land battle ever fought by the United States Army.